This jacket is super easy to make and is a great example of how you can change and re-style its of clothing time after time. 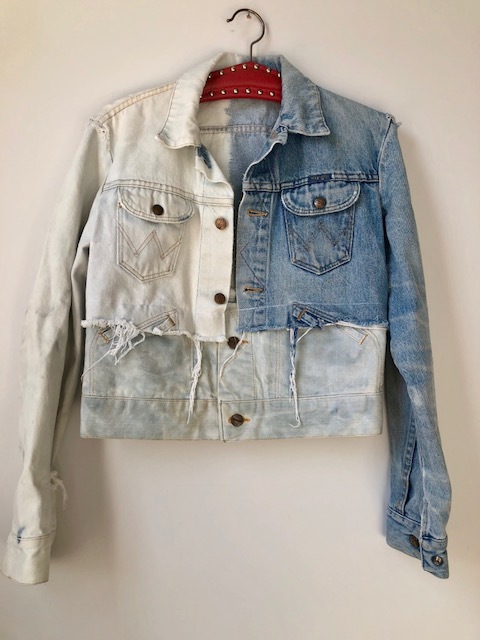 Initially I bleached half a denim jacket using the technique 'How To Bleach A Jacket', then when I had got bored of wearing it this way I decided to chop the bottom off the original jacket and add the bottom of another jacket to it. The easy to thing to do is find the centre back of each jacket and place these together and pin. When you sew them together it is best to start from this centre point and work outwards towards the front. I.e sewing half at a time. I decided to over lap and simply placed the jacket top on top of the bottom jacket and ran a siege line of running stitch along it to keep in place. To achieve the ragged and worn finish I simply put the finished jacket in the washing machine with some fabric conditioner for a quick wash and then left to air dry. I love the way that the top and bottom aren't matching sizes!